Head of Hiddush Rabbi Uri Regev, esq. : "The no-confidence vote against the Orthodox establishment's monopoly is tremendous." Director of the Center for Women's Justice Dr. Susan Weiss, esq. 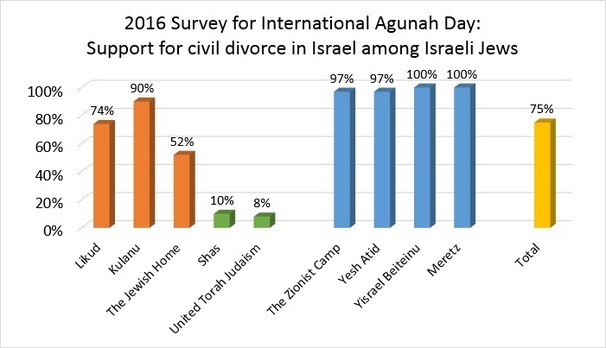 : "The solution to the agunah crisis - civil marriage and divorce." CEO of Mavoi Satum Batya Kahana-Dror, Esq. : "Alienation from Israel's religious institutions is growing." 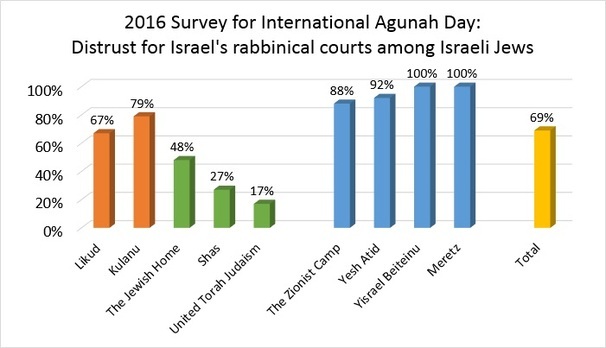 In honor of International Agunah Day 2016, Hiddush, the Center for Women's Justice, and Mavoi Satum commissioned a survey by the Rafi Smith Polling Institute. It was conducted last week via an Internet panel among a representative sample of 500 adult Israeli Jews. Many other surveys have examined the levels of support for civil marriage in Israel, but surveys dealing with matters of divorce in Israel are relatively rare. This survey was conducted with generous support from IREP - the Israel Religious Expression Platform. 75% of the Jewish public supports the introduction of civil divorce in Israel, including 58% who favor civil divorce for all, and 17% who favor civil divorce for those who were married in civil ceremonies. 69% of Israel's Jewish public does not trust the state rabbinical courts, of which 35% have no trust for them at all, and 34% are disinclined to trust them. However, 52% of respondents also have no trust for the civil family courts. Head of Hiddush Rabbi Uri Regev said in response that "The survey is a tremendous vote of no confidence in the Orthodox establishment's monopoly. The public has resoundingly rejected the state rabbinical court system, which discriminates against women, traps many women seeking divorce in loveless and sometimes abusive marriages, and empowers their husbands to bribe them for their freedom. All successive Israeli governments have sold off the public's freedoms of marriage and divorce to the fundamentalist establishment; until Israel recognizes civil marriage and divorce, it will remain among the most regressive countries in the world in this realm." Executive Director of Mavoi Satum Batya Kahana-Dror, Esq. explained, "The data indicate that the rabbinical monopoly is losing its legitimacy. Alienation from Israel's religious institutions is growing among Orthodox and traditional Jews." Dror added, "This damages not only the democratic character of the state, but also its Jewish character. Israeli law should reflect the public's will, and permit freedom of choice in marriage and divorce." Director of the Center for Women's Justice Dr. Susan Weiss, Esq. stated, "The right to marry and the right to divorce are fundamental human rights. 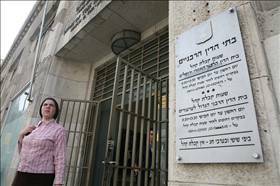 Israel's imposition of Torah law on its citizens is a violation of human rights, and it unnecessarily causes more women to become agunot. Officially adopting civil marriage and divorce in Israel will significantly reduce the number chained women, and would be the first and necessary step towards a comprehensive solution of this terrible phenomenon." Support for civil divorce (75%) is greater than support for civil marriage, which consistently polls at approximately 65%. Among the secular public, 99% supports civil divorce, including 88% who support civil divorce for all, and 11% support civil divorce for those who were married in civil ceremonies. However, 66% of Zionist Orthodox Israelis oppose this, as do 93% of the ultra-Orthodox. 79% of women favor introducing civil divorce, compared to 71% of men. Among the opposition parties' voters, support for civil divorce approaches 100%: including 97% of voters for the Zionist Camp and Yesh Atid parties, and 100% of Israel Beiteinu and Meretz voters. Even among the non-Orthodox coalition parties' voters, 74% favor civil divorce (including 53% who support this measure for all Israelis), including 90% of Kulanu voters. Perhaps most surprising: 52% of the Zionist Orthodox Jewish Home party's supporters favor civil divorce, likely representing the large faction of non-religious voters for the Jewish Home. 69% of respondents do not trust the state rabbinical courts, including 93% of secular Jews and 60% of traditional Jews. However, 65% (almost two-thirds) of Zionist Orthodox Jews and 82% of the ultra-Orthodox trust the rabbinical courts. Interestingly, 18% of Haredim, 27% of Shas party voters and 17% of voters for United Torah Judaism do not trust the rabbinical courts. Neither do 100% of Israel Beiteinu and 67% of Likud voters. 52% of the Jewish public are disinclined to trust the civil family courts, leaving only 48% who have confidence in the non-religious courts to deal with matrimonial matters. There is no difference in this regard between men and women. Of the 52%, 40% expressed no trust whatsoever in the family courts, and 12% said they were disinclined to trust them. This nearly 1:1 ratio of Jews who trust the family courts to those who do not can be found across three sectors of Israeli society: among secular Jews, 51% trust the family courts, as do 56% of traditional and Zionist Orthodox Jews. However, only 24% of the ultra-Orthodox community trusts the civil family courts.